I have wanted to publish a digital book with Amazon for several months. New developments allowed me to make this happen quickly—Amazon now has a plugin for Adobe inDesign that allows easy conversion from inDesign files to Mobi files (the type necessary to publish on the Kindle). 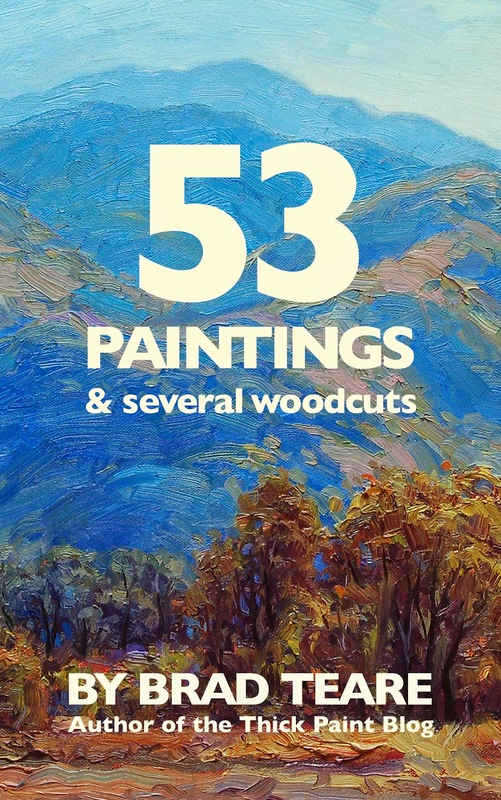 As the title suggests the book is a collection of 53 paintings along with a handful of woodcuts accompanied by short paragraphs describing the work and in some cases the technique. Be sure to pinch the images to get close-up views of the thick texture. There is a short essay at the end of the book about painting with thick paint. I made the book so I can view my work in the field. In a month I'll be going to the Door County Plein Air Festival and I find it useful to be able to view a variety of paintings as a means to get into the flow. It's a big confidence booster and I want to give Door County my best effort. The book is made specifically for viewing on the Kindle reader for the iPhone. I always have my iPhone with me in the field and it should prove very convenient. But the book also works on the Kindle Fire, as well as the Kindle Reader for any Android phone, or PC or Mac computer. It really is a great way to view work away from the studio. If you have a Prime account you can borrow it for free. If you download it I hope you will consider giving it a review. I am awestruck with the sample pages, I can only imagine the full book's impact. I can't buy it from where I am, have asked my brother in the US to download it for me. Your enthusiasm is a huge support to me, Padmaja. Many thanks! I'm a fan of your YouTube channel. Just bought your book and love it. However, the images in the book seemed low-resolution when viewed on my iPad Air, even after I tapped on the pictures. Not sure if others also have this problem. Hi JL. I've attempted to get the iPad version of the book to appear unblurry but have been unsuccessful. I did remove the statement that it works on the iPad. If you would email me your address (not in the comments–you'll get spam) I would send you a 9 value grayscale to make up for your loss. There is some kind of filter that down sizes all the images so the upload won't be excessive but it doesn't seem to optimize for iPad. Thanks for the feedback, JL.I didn't test int on the Air but will do so soon and fix the problem. I didn't test it because the Kindle plugin was suppose to maximize for Kindle Fire and I assumed that would work on the iPad Air as wall. I trusted the technology and didn't test on the Air. Will double check on it pronto. Thanks again.